The tribe attributed the low returns to the so-called Godzilla El Niño that is under way in the Pacific, exacerbated by a “blob of warm water off the coast,” the Quinault said in a statement describing what it called a dire situation. The announcements affect sport, commercial and recreational fisheries and comes three months before the scheduled season end. The moves were made necessary by an extremely low return of coho, one that fell “significantly lower than the pre-season forecast,” the WDFW said in a statement. Quinalt members fishing from canoe using nets. 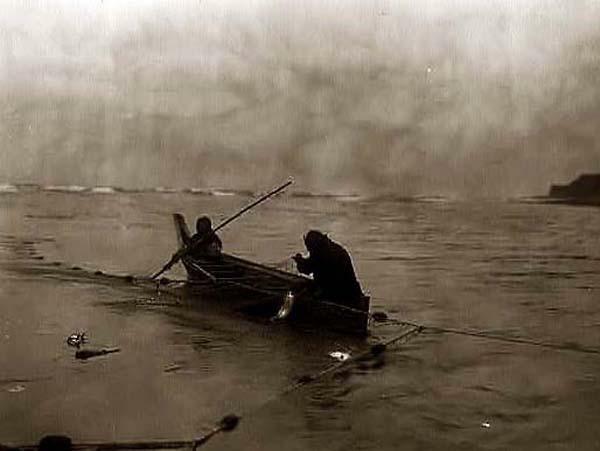 Photo by Edward S Curtis. “With such a low return, we need to take this step now to help us reach spawning goals and other conservation objectives,” said Steve Thiesfeld, regional fish program manager for WDFW, in the statement. In the Columbia River tributaries, the early run coho are at about one-third the 26,000 that were predicted, said WDFW southwest regional fish manager Cindy LeFleur in a separate statement. The Quinault have been working closely with state officials to determine the best course of action. The crisis has caused the tribe and the WDFW to take a closer look at fisheries of other salmon and steelhead, the Quinault said. The El Niño and warm water are not going away any time soon, the tribe said. In addition, drought and adverse ocean conditions are forecast to persist for months and could have a marked impact on food chains, Johnstone said. Adding to the concern, he said, was the poor health of the salmon that did make the trip back to spawn. The salmon situation is reflective of ocean health as a whole, Sharp said, given myriad problems including acidification, sea level rise and increasingly strong storms. She took the opportunity to inject a cautionary note regarding climate change and potentially harmful industrial development. Posted on October 30, 2015, in Apocalypse Now, Fisheries and tagged climate change, coho salmon, El Nino, ocean warming, Quinalt, Quinalt Indian Nation, salmon fishery. Bookmark the permalink. 4 Comments. Forest fires were so brutal this year. My thoughts are of you. Let’s hope next year isn’t another year of hell.